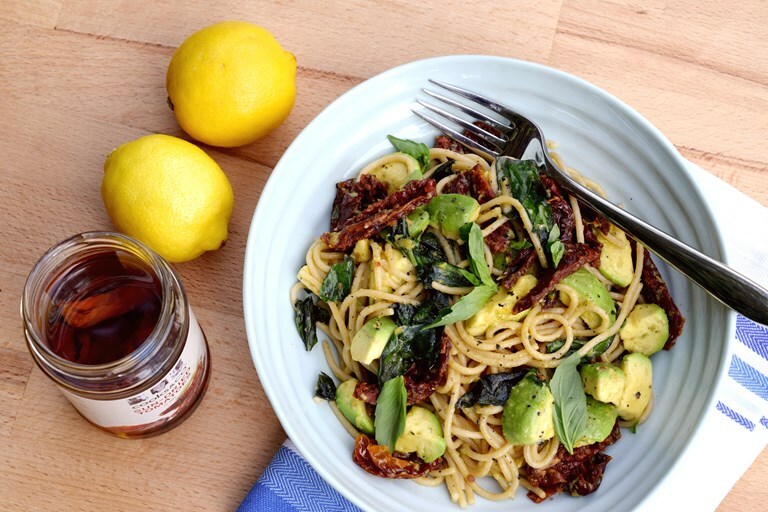 Rachel Phipps serves up a quick and simple sun-dried tomato and avocado pasta recipe. The avocado creates a creamy feel for the dish, while the beautiful sun-dried tomatoes add punchy, vibrant flavour. Inspired by what is actually a killer avocado toast topping, chunks of creamy avocado, along with sun-dried tomato pieces (straight from the oil they’re preserved in) make the most wonderful light, rich and buttery sauce for wholemeal spaghetti. This combination is then helped along with some Italian classics such as extra virgin olive oil, fresh basil, freshly ground sea salt and black pepper, and a spritz of fresh lemon to make for a quick and satisfying lunch or supper. Feel free to substitute regular spaghetti, but wholemeal has a depth and a bite that brings out the mild flavour of the avocado, and stands up to the power of the tomatoes. It is rare, but sometimes a canned or preserved ingredient can do something their fresh counterparts can’t. I’m all for bright, plump tomatoes when they’re in season, but outside of high summer small, wrinkly sun-dried tomatoes do the job so much better. The drying process concentrates the flavour, adding a deeper, more satisfying bite to the dish that something watery and pale simply cannot achieve.